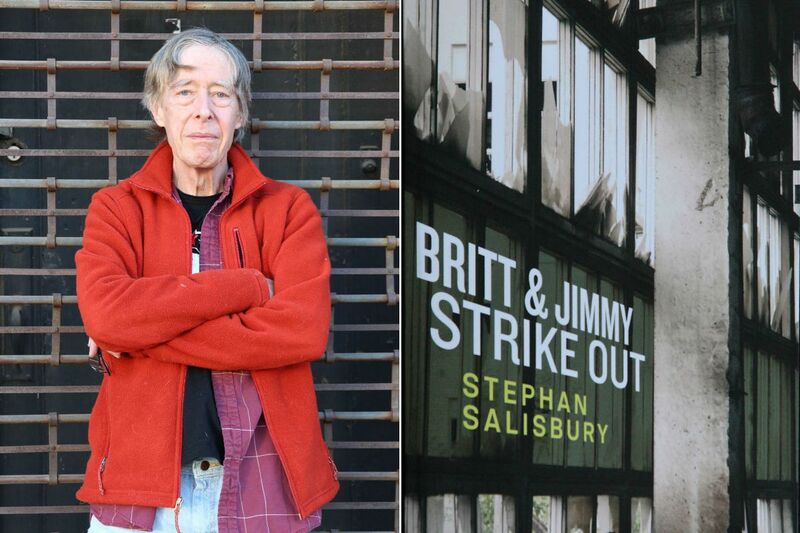 Stephan Salisbury, author of "Britt & Jimmy Strike Out." Courtesy of Alternative Book Press. Alternative Book Press. 342 pp. $19.99. If the morning headlines on your screen challenge you to consider which of all the possible future worlds you might be hurtling toward, then Britt & Jimmy Strike Out is the novel for you. Inquirer arts writer Stephan Salisbury lifts us out of the queasy present day, which so many find unsettling and out of kilter, and tosses us into a future where the worst of our current experience has been shot through with steroids to become the norm. This is a dark and deeply cautionary dystopian novel of extrapolation. But wait, come back — this is also a vivid, ingenious, and very funny novel. Clever wordplay abounds along with allusions to our own past, in the form of mythology and painted advertising slogans that have, through the ages, partially worn from crumbling walls to form puzzles to solve as we follow Britt and Jimmy on their strange trip. Salisbury conjures a world consisting of the Zone, the Ville, and the Hood (although the reader might find the latter two difficult to distinguish). This is a world in which citizens make and view (and post comments on) videos sponsored by recycled products, which is just about all anyone does; citizen-consumers live to participate in social media, their walls covered with screens streaming images of themselves and others in rooms, including bedrooms, outfitted with camera arrays and blackout curtains. Crucially, this vast network is kept "well-oiled and humming" by the President, or "P," himself. P is, of course, the Brander-in-Chief. The spider at the center of the national branding web, he provides streamed advice, product, and reward points that can be redeemed to spend time (and to record time spent) at the alluring, if possibly illusory, White-House-by-the-Sea. Citizens rely on their ability to brand their sponsored video streams with clarity and to maximize sales by maintaining their brands' sharp focus. Personal identity is wrapped up entirely in brand maintenance; those who allow their brands to become fuzzy or confused risk losing sales, risk losing self, risk disappearing altogether. Salisbury devotes the early chapters mostly to exposition, settling the reader within a world that morphs present-day America, with its own Brander-in-Chief, into the extreme case — social-media mania and, except by way of myth and rumor, total ignorance of history and of the lay of the land beyond the blackout curtains. One might take issue with such deferral of rising action in plot development, but readers arguably need sufficient time to become acquainted with these intimations of our future. When the plot revs up, the reader is in for a ride. Britt, a popular social-media presence, has allowed her own brand ("Hip") to become confused and has lost viewers and sales. Her best friend, Deb, has disappeared after suffering a similar branding fate. She had branded herself, very successfully, as "The President's Girl," but, against Britt's advice, had rebranded herself as "The Boy's Lost Girl" instead. Sales have tanked, viewers have fled, and now she is, literally, a lost girl. Britt's subversive friend Jimmy records and posts what is happening on the streets, which has roused the interest of two of P's agents, who visit in order to cajole them into getting with the system. Britt and Jimmy become spooked by this attention and decide to leave the Hood in search of Deb. So begins the quest. Britt and Jimmy strike out deep into a wasteland of crumbling buildings and continuously sifting ashfall, where the duo serially encounter denizens of that terrible terrain, each memorable set piece leading to another and finally to the Pits, where all of that world's refuse (and inhabitants who have been picked up by P's giant street-vacuuming machines) is heaved into a seemingly limitless trench to be picked over by massive drones, then sucked up by huge machines and recycled. Britt & Jimmy Strike Out is filled (at times beyond the brim) with odd characters and ingenious details of a world reminiscent of ours, in which the president runs a country steeped in branding and gossip and, yes, astonishingly fake news. In the end, the reader will come to understand how our society's delicate connective tissue could morph into the world of Britt and Jimmy and will decide, when they strike out in search of their friend, whether Britt and Jimmy indeed strike out. R.P. Finch is author of Skin in the Game (Livingston Press).